Summer is finally here and the Township of Johnson is revving up for the 45th annual Desbarats Community Night, which will kick off from the old Johnson Tarbutt Public School grounds on Saturday, July 8th at 7PM with the annual Parade, this year featuring perennial favourites the Sault Ste. Marie Pipe Band. The Parade will end up at the Johnson Township Community Centre where the pipe band will give a concert by the Farmer’s Market Building. 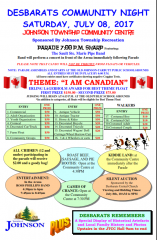 The theme for this year’s parade is “I Am Canadian”, to celebrate Canada’s 150th Birthday. Thanks to a donation to Johnson Recreation by Erling Lagerholm, the Theme Float Grand Prize this year will be $150 and second prize will be $75. There are also $50 prize moneys to be won for other various themed floats, including Commercial, Adult and Youth Organization, Comical, Summer Resident, Private Decorated Car or Truck, Farm Float, Community Groups, Antique Vehicle and Tractor, and Horse and Rider, as well as $20 prizes for Best Decorated Bicycle, Tricycle, Wagon/Doll Carriage/Wheel Barrow/Cart and 3&4 Wheelers. Walkers are eligible for cash prizes for Best Costumes and all children participating in the Parade will receive a tooney and a goodie bag. The Honorary Parade Marshall is once again the township’s Senior of the Year, this year awarded posthumously to Kelly Hopkins, a great supporter of Recreation programs and of the township in general. Kelly, who passed away suddenly earlier this year, was a gregarious and public persona in Desbarats who volunteered his help as a door person and registration-taker at many Recreation events despite suffering from some serious health issues. As in previous years, and due to safety concerns, candy will not be thrown from the floats but may be handed out by float volunteers. The Sausage Booth, the Women’s Institute’s Roast Beef Booth, and the Gordon Lake Social Club’s famous Pie Booth will open at the Community Centre Arena from 4:30PM to 6PM and again after the Parade. Local group The Ross Phillips Band will appear in the Arena from 4:30PM to 7PM and again after the Parade. KiddieLand and Games of Chance will also open after the Parade ends. As in other years, the Desbarats United Church will sponsor a Silent Auction with viewing and bidding times on Saturday from 10 AM to 9 PM. A new initiative, led by local residents Sylvia Stobie and Lois Charron, will be a Desbarats Remembers display upstairs in the Hall. The display will include historical and family memorabilia, photos, and a slideshow, featuring settler families of the surrounding area, including Portlock and Gordon Lake. In the spirit of environmental responsibility, the Johnson Township Recreation Committee would also like to let the public know that many of the cups, plates and utensils used at this year’s Community event will be made up of compostable corn-based or recyclable paper products. Large barrels will be available throughout the Arena to accept these materials and the Committee is asking the public for their help in disposing of their garbage in the proper receptacles. Parades, games, music, food and non-stop fun, come out and celebrate your community!